Because of the lack of the available data I decided to compile some interesting statistics about the smartphone usage in Lithuania. There is publically available data source which data I have compiled into something more readable. The source is gemiusRanking which can be found at http://www.ranking.lt. I took a ranking of mobile devices that are used by persons connecting from Lithuania with Lithuanian web sites. The ranking is created on the basis of the website-averaged percentage share of page views on sites participating in gemiusTraffic which delivers statistics for the major part of Lithuanian web traffic. So the source is the only credible source you can find currently. I will start from the traffic delivered by the mobile device type. In the first chart you can see that the major part of mobile traffic is delivered by ordinary mobile phones – 43% of mobile web traffic. 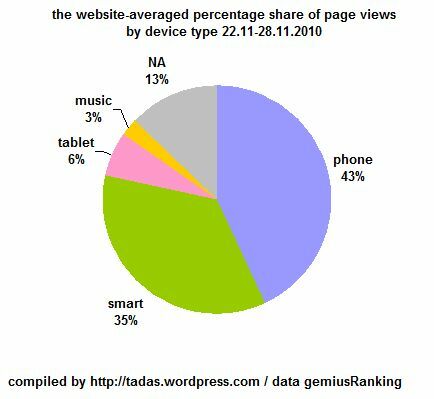 74% of that traffic is made by Nokia s40 devices, 17% is made by Sony Ericsson, 7% – Samsung, 2% – LG. The second largest part of mobile web traffic is made by smartphones, more details bellow. Apple’s iPad delivers 6% of mobile web traffic and Apple’s iPod delivers 3% of mobile web traffic. 13% of mobile web traffic is not identified. So in reality there maybe a little bit different picture, but anyway we can see and evaluate current trend. Secondly, I take only traffic that is made by smartphones and divide that traffic by smartphone os family. 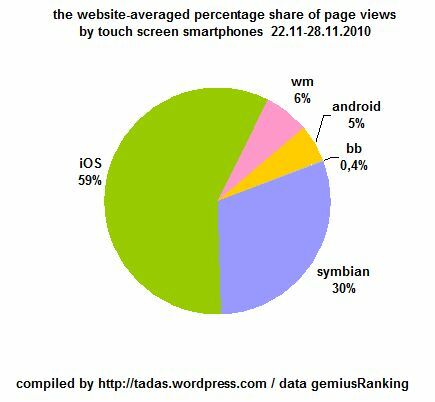 49% of that traffic is made by Symbian, 42% by Apple’s iOS. Those two mobile operating systems has the largest share of smarphone web traffic. Windows Mobile OS has 5%, Android – 4%. As mentioned before not all mobile web traffic is identified, but still this is the best we can have currently. Finally I split smartphones which have touchscreens and we get different picture. 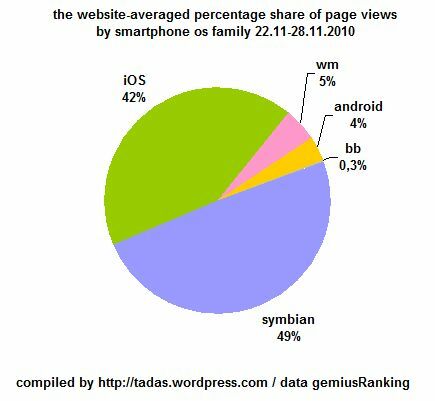 I exclude Nokia s60v3 and s60v2 devices which account for 56% of all Symbian devices traffic. 73% of smartphone web traffic is made with touchscreen devices. But keep in mind that smartphone touchscreen devices account only for 29% of all mobile website traffic. Apple iOS is the leader, iPhone has 59% of smartphone web traffic, Symbian devices, i.e. s60v5, has 30% of smartphone with touchscreens web traffic, then Windows Mobile – 6%, Android – 5% and BlackBerry – 0,4%. So if you plan to make some mobile application for Lithuania Apple iPhone and Nokia s60v5 devices should come first. It would be interesting to see the trend for longer period, whether Symbian s60v5 devices are decreasing, how fast Android devices are growing? If you have some thoughts, please leave a comment. Nieko radikalaus. StatCounter nėra patikimas ir tikslus šaltinis. Ir tikriausiai skaičiuoja vartotojus, o ne peržiūrėtus puslapius. Tiesiog obuoliai ir kriaušės.